This latté is delicious and has two of my favorite herbs, turmeric and ginger. I spent a couple of weeks experimenting and checking out other recipes and am so happy with this final drink. I hope you try it and love it! Science backs up turmeric as having powerful anti-inflammatory effects as well as being a strong antioxidant. It has compounds called curcuminoids, the most important one being curcumin. Interestingly, curcumin is poorly absorbed into the bloodstream. However, when it is consumed with black pepper the absorption rate goes up by 2000%. Cool, huh? I’ve heard of people swallowing a few peppercorns with their curcumin supplement and although I haven’t tried it personally it seems like a good idea. Ginger is commonly used for stomach upset and to reduce nausea and vomiting. It also has anti-inflammatory compounds, is a antioxident and may have a mild analgesic effect. I love how warming it is without being overly spicy. A visual introduction to the ingredients, voilà! Fresh ginger (higher) and turmeric. In following: Honey, black pepper, blue lotus chai powder, milk of your choice and coconut oil. Now, let’s make our tea! 1. Break off an inch or so of each spice, scrape skin off with a spoon and mince it up. Put this in your blender. 2. Warm your milk on the stove, somewhere around 12 – 16oz. Bring it just to a boil. This is especially important if you’re using cow’s milk, because ginger will curdle cow’s milk if it hasn’t been brought to a boil first. Pour the simmering milk on top of the spices. 3. Next, add a tablespoon of raw, unrefined coconut-oil. This makes it extra creamy and yummy while giving you all of the oil’s health benefits. 4. The Blue Lotus Chai comes with a cute wooden scoop. Put 1 – 2 rounded scoops of the chai powder into your blender. If you don’t want the caffeine, no problem – just leave this out. If I’m drinking it in the morning I’ll use the chai, and if it’s before bed I’ll omit it. Likewise, if I’m making it for my energetic kids, I assure you I skip this step. 5. Grind some black pepper in. A couple twists should be fine. 6. Add the sweetener of your choice: Honey, maple syrup or coconut-palm sugar are my suggestions. Start light and increase according to the whispers of your taste buds. 7. I’m hoping you have a Vitamix or other high-speed blender, and that you’ll set it on high until foamy and sinfully smooth. If you have a regular blender your latté may be a little chunky, in which case you could just strain it through a mesh colander or cheese cloth to achieve a similarly-silky consistency. 8. Pour into your favorite cup, single out your favorite chair and have gratitude for your life. I hope you enjoy your super-healthy latté and that you treat your friends and family! One can make a larger amount and store it in the fridge to re-heat later. Each time you make it, tweak the recipe to your liking by adjusting the spices. 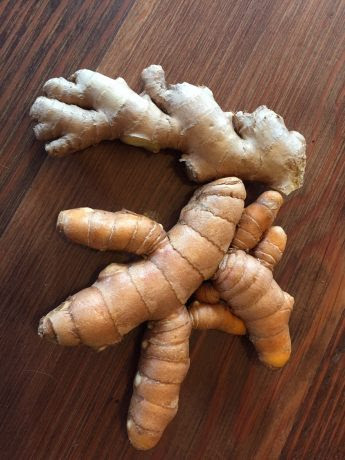 The turmeric is mild and slightly sweet, and ginger adds to the bite.